Few people contributed more to the cultural life of Leicester during the first half of the 20th century than Charles Squire. He was born in Leicester in 1871, the son of the Lincolnshire-born draper William Squire (1813 – 1892) and his wife Jane. William Squire was one of the brothers who founded and ran the leading Leicestershire department store of Morgan Squire Ltd at 17 – 25 Hotel Street and continuing around the corner in 2 – 4 Millstone Lane, Leicester. At the time of the 1881 Census Charles was a scholar living with his parents at 57 King Street, Leicester. Ten years later the family was living at 63 King Street, and the 20 year old Charles was listed in the Census as a Solicitor’s Articled Clerk. In June 1897 he was married in the ancient village of Calverley, (now part of Pudsey in the Leeds Metropolitan District), half way between Leeds and Bradford West Yorkshire. His 25 year old bride was Calverley-born Kate Jane Atkinson (1872 – 1986), the daughter of a local Woollen Manufacturer, Thomas Atkinson. It seems likely that the couple met through contacts between their respective family firms. However, Kate had an elder brother, Thomas, exactly the same age as Charles Squire who in the 1891 Census was also recorded as a Solicitor’s Articled Clerk and who would have been fully qualified by 1897, so the couple could have met through Jane’s brother. The Kelly’s Leicester Directories show that by 1899 he was in practice under his own name at 5 Hotel Street, Leicester, but by 1916 he was in the partnership of Parsons and Squire Solicitors (formerly Parsons, Davis and Barlow) at 16 Friar Lane, Leicester. In the 1901 Census Charles and Kate Squire were recorded as living at “Newhurst”, Stoneygate Road, Leicester, and by the time of the 1911 Census they, and their young daughter Phyllis, were living at Appleby, Barrington Road (off Guilford Road), Leicester. The city’s libraries and museums became nationally known for their high standards and innovations during the long period under the leadership of Alderman Charles Squire. Major new libraries to similar avant-garde circular designs were built at St. Barnabas Road (1937) and Southfields (1939), both by the Leicester architects Symington, Prince and Pike, to serve the rapidly growing populations of the expanding city. In relation to museums and the heritage major developments in the 1920s included the creation of the UK’s first Museum School Service, and the building of the Museum Square wing of the New Walk Museum including purpose-built City Record Office accommodation and additional art galleries. The 1930s save the saving and restoration of the 16th century Newarke Houses and Chantry House to create the Newarke Houses Museum, and of the 1707 Belgrave Hall and the adjacent important Georgian houses of Belgrave House and Cross Corners and their period gardens. The inter-war period also saw first the archaeological excavations at Leicester Abbey, led by Waller Bedingfield (Lit. & Phil. President (1930-31) in 1928-30, and those of the Jewry Wall site by Kathleen Kenyon from 1936. Squire was also a key member of the Local Committee for the Leicester Annual Meeting of the British Association for the Advancement of Science in 1933, with special responsibility for all the entertainments and cultural events. Finally, but by no means least, he successfully defended and led the museums through the very difficult years of World War II. Innovations included programmes of “Holidays at Home” cultural events for those unable to travel because of wartime restrictions and the economic situation, the start of the Museum’s Lunchtime Concert series, and temporary exhibitions of contemporary art in galleries from which the permanent collections had been evacuated to the country, most notably the first exhibition out of which Leicester’s remarkable German Expressionist art collection began to develop. Squire was also very active at the national level in the museum field. Under his chairmanship Leicester hosted the annual Conference of The Museums Association in 1924, with Leicester’s Libraries and Museums Director, Dr. E.E. Lowe as the Association’s President for the year. Following this Squire was a long-serving Treasurer of the Association, bringing his legal and business knowledge to the development and sound management of the national body for museums and museum professionals. In July 1936 he was elected President of the Association, and during his presidential year important Leicester events involving the Association and its senior members included the official openings of Belgrave Hall and the opening of public viewing facilities and a temporary exhibition at the Jewry Wall site excavation of what proved to be the Roman baths of the Roman city of Ratae. 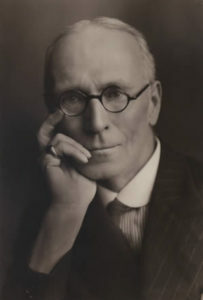 At end of his year of office he gave a wide-ranging Presidential Address to the 1937 Annual Conference being held in Newcastle under the title of “Reflections of a Committee Man”, urging local authorities to take their museum service responsibilities much more seriously and to provide more substantial financial assistance to the museums of their areas. More generally he argued that the old generation, which regarded museums as of no account, was passing away and the new generation de­manded new conditions. He questioned whether in their museums there had not been top much concentration on the past and too little on the present. Without sacrificing the all-important teachings of the past it would be well to do more in the way of illustrating the present-day activities of modern life, such as town planning and local industries. In his vote of thanks for the Address the incoming President Dr. (later Sir) Mortimer Wheeler, Director of the National Museum of Wales, stressed that the excavation and preservation of the Jewry Wall site (originally intended to be built over) “was due largely to Alderman Squire’s energy”. Charles Squire died in Leicester in 1945. (Kate lived on, also in Leicester, to 1986.) On 20th June 1949 the opening event of the celebrations to mark the centenary of the opening of the New Walk Museum and Art Gallery was a civic luncheon in the Museum and the naming of one of the art galleries as the Charles Squire Memorial Room. Main Sources: UK Censuses for 1881 to 1911; Births, Marriages and Deaths Registers; Calverley parish records; Leicester Trade Directories; The Times 7th July 1937, and 20th & 21st June 1949.